Hello, Belvedere Designs fans! 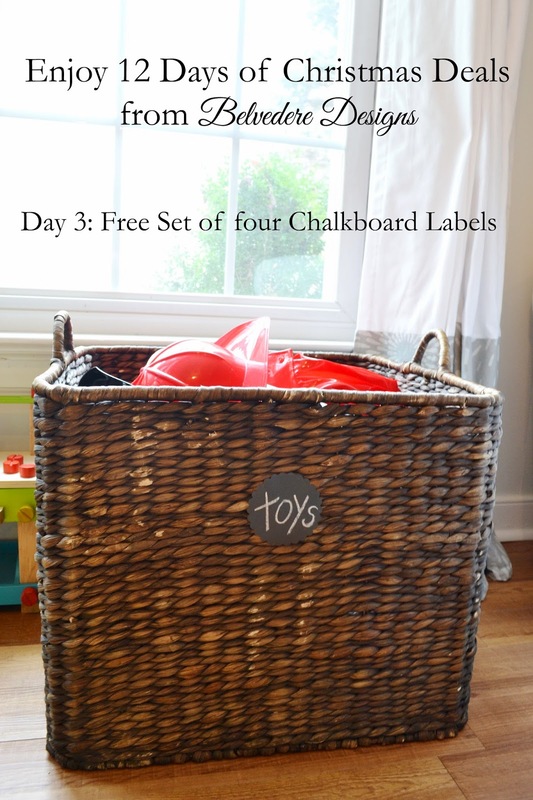 It's Day 3 of our 12 Days of Christmas promotion, and today's freebie is a favorite of mine...scalloped chalkboard decals! These are so versatile; use them for everything from labeling to organizing and more! We even used them for our "Days Until Christmas" board a couple of weeks ago. I especially love using them for organizing, see how they gussy up my kids' formerly plain toy basket? These are free with any order, but you MUST let us know you want them when you order! In the comments section of your order, please ask for the "Day 3 Chalkboard Labels," and we'll know to include them. Wow, these are awesome. I love these chalk labels. Not only are the great looking but they're reusable. Thanks!